Just 29 light-years away from us, the star AU Microscopii can be described as a close neighbor. This red dwarf, which is ‘only’ half the mass of our Sun, lies in the southern constellation Microscopium — unfortunately, is not visible in the northern hemisphere. Until 2014, astronomers considered it a ‘simple’ young star surrounded by a large disc of dust (the protoplanetary disk, the cradle of planets)… but AU Microscopii is not simple, its hide something very unusual. From data provided by ESO’s Very Large Telescope (VLT) in Chile and the Hubble Space Telescope, an international team of astronomers, led by Dr. Anthony Boccaletti of the Paris Observatory, revealed an intriguing phenomenon within the dusty disc around AU Microscopii: a fast-moving wave-like structures traveling at high speed in the protoplanetary disk — unique features unlike anything ever observed. said Dr. Boccaletti ~ lead author on a study published in the journal Nature. The ‘waves’ in question, are moving away from the star at speeds ranging from 4 to 10 kilometers per second, and those located furthest from the star appear to move fastest. At least three of them go fast enough to eventually escape the gravitational attraction of AU Microscopii. said co-author Dr Christian Thalmann. said co-author Dr Carol Grady. So, what cause these mysterious ripples? For now, scientists are left to speculate. After dismissing the possibility of gravitational perturbations caused by the planets, or the collision of large asteroids, they issued a theory: ‘guilty’ could be … solar flares. 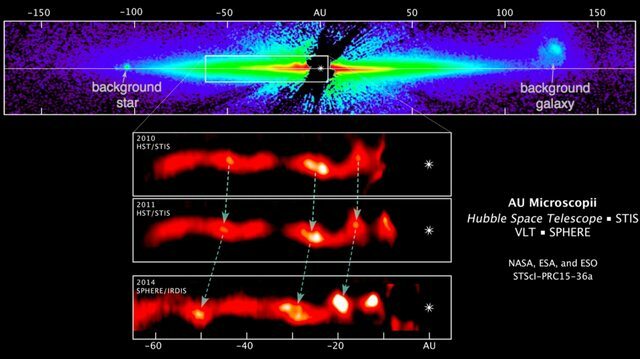 This set of images of a 40 billion-mile diameter edge-on disk encircling AU Microscopii reveals a string of wave-like features. ©NASA / ESA / ESO / A.
said co-author Dr Glenn Schneider. AU Microscopii is a star with high flaring activity – it often lets off huge and sudden bursts of energy from on or near its surface. Young stars, like AU Microscopii, are wildly active. They emits large amounts of energy and matter in space — as huge eruptions of charged particles. If one of these eruptions, common on AU Microscopii, hits a forming planet, it could easily strip material away from the planet and propagate it outward at rapid speeds. For now, no planet has been observed. Researchers continue, of course, to study the star and its disk of debries to understand what is happening. But sometimes you just have to throw up you hands and say ‘We don’t know what it is yet and we’ll keep looking and keep thinking to try to come up with the answer. © Featured image credit: Top and middle rows show Hubble images of the AU Microscopii disc from 2010 and 2011, the bottom row is an image taken with VLT’s SPHERE instrument in 2014. The black central circles show where the brilliant light of the central star has been blocked off to reveal the much fainter disc, and the position of the star is indicated schematically. The scale bar at the top of the picture indicates the diameter of the orbit of the planet Neptune in the Solar System (60 AU). Image credit: ESO / NASA / ESA.